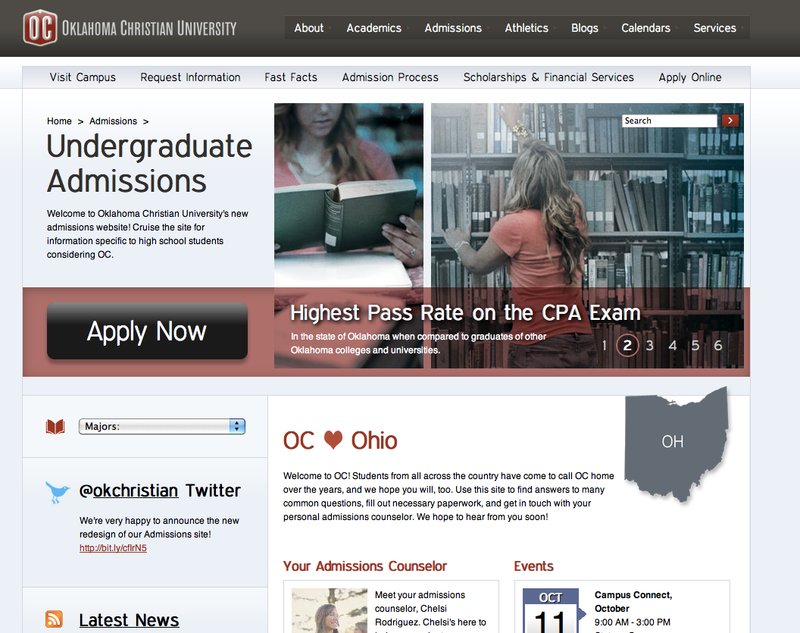 Thanks to Ann White’s Twitter, I had the chance to check out Oklahoma Christian University’s new admissions site. It’s nice and clean, and something struck me in the Undergraduate area – something I really haven’t seen a lot of. They’re using Geolocation and GeoIP services to customize content based on where I’m coming from. When I loaded the page, I was greeted with content specifically geared towards Ohio, where I’m located. It looks like this. You can click on it for a larger version. Using a few web proxies, I got a message and graphic for a few other states, such as the great state of Delaware. So far, OKC is just using this to show a graphic and a message telling me they love my state, which to be honest I don’t know if I even do yet, but it does present an interesting opportunity. It would be easy to display content directly related to my state, such as the admission counselor assigned to my region, if they’re going to be in my area for interviews or college fairs, or some current students and alumni from my state. Something to keep in mind with this type of customization is that it’s not always easy to tell where the user is from. As Steven Bell, who developed this for OKC noted, testing for this type of content is tough. Often, you’re the best guess of where the IP is located, and if you’re near a state or country border, you may get the wrong results. Despite the challenges, it’s a pretty neat implementation of geolocation. Looks like there’s a bit more too it than just the state based greeting. As a visitor from outside of the US, I’m presented with content and links specifically targeted at international applicants – clever stuff. Wow. So many possibilities. Bravo to OCU and Steven for leading the way.